Two hundred and forty-one years ago today, a maritime hegemony ran into some heavy going. Squalls had been building for a year, and the hegemonic elite probably saw nothing special about a proclamation issued in Philadelphia on that particular day. And, indeed the sun was still rising on the British Empire; full day would only break some decades later, after an artillery officer from Corsica was forcibly retired to St Helena. Only far along the plausible midfuture of 1776 would the United States take its turn on Neptune's throne. Now that hold is being shaken, from the most bizarre of causes. Of all the many subplots of our current national nightmare comedy, none can be funnier or more nightmarish - or just plain surprising - as the ascendency of self-proclaimed nationalists who seem to regard American maritime hegemony as a dreadful thing that should be done away with, in favor of a world order (or disorder) dominated by 'spheres of influence'. To be sure, this would be an understandable perspective for, say, Chinese nationalists. Or nationalists from another well known Eurasian power distinguished for its achievements in space. But for American 'nationalists' to share this perspective is ... remarkable. I know there were in late Victorian days 'Little Englanders', about whom I know only the name, though a quick google shows that the term has been revived in the context of Brexit, offering some context. Indeed, some factions in ancient Athens point in a rather similar direction - providing an unexpected segue to my broader topic. I could say a lot more about the current American moment, but there are lots of places for that discussion, and not so many for the one I will now segue to. 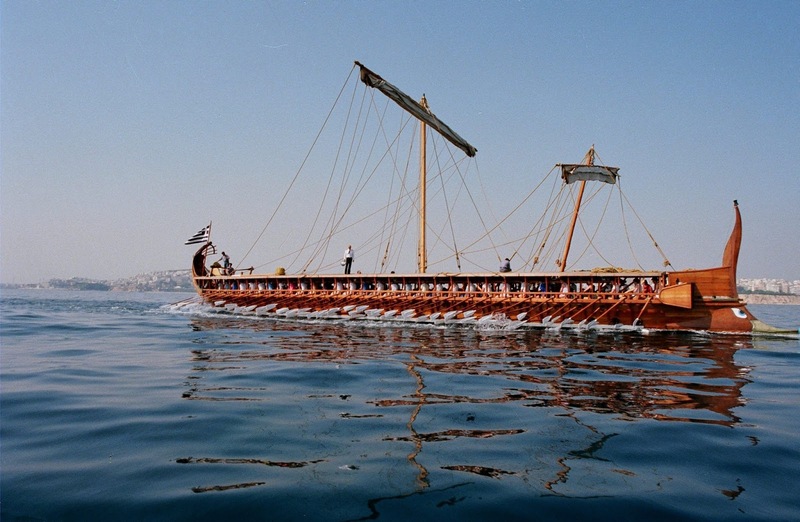 To paraphrase Thucydides (the ancient historian, not the commenter on this blog), the Athenians were the first polity that we know to have possessed a maritime hegemony. There is a line of speculation - with roots in Thucydides - that Minoan Crete might have had something of the sort. The unfortified palace of Knossos perhaps gives a hint in that direction, as do some frescoes, including one suggestive of a harbor ceremony, in the 'House of the Admiral' on Thera. A hegemony, in general, is an empire that favors indirect rule and a relatively modest profile (as empires go). A maritime hegemony, naturally, is one sustained through sea power, which broadly understood extends beyond battle fleets to the 'soft power' of sea trade. There is a certain logic to maritime hegemony: 'distant storm-beaten ships' are inherently less in your face than tanks rolling down your street, And perhaps it is rooted in the differences between soldiers and sailors. This is reflected in myth. The Iliad is a soldier's epic, all about the dangers and comradeship of battle, and what happens when a commanding officer disrespects his troops. 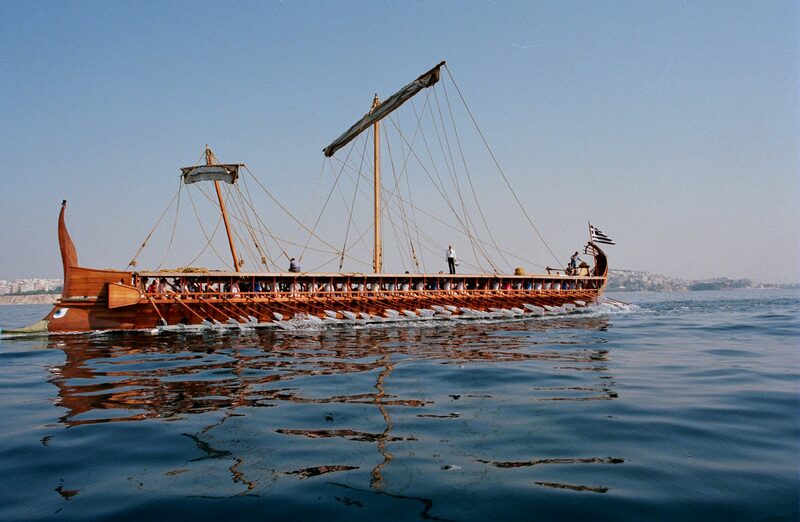 The Odyssey is a sailor's epic, all about the perils of the sea and the will to reach homeport. A curious and striking fact about those maritime hegemonies is that four out of the five had republican political systems. * Even the fifth, Britain, was something of a crowned republic, the monarch a sort of hereditary Doge. * It is an odd fact that the ancient Greeks had no word for republic, at least no familiar one. We call Plato's book by its Latin name, which surely would have puzzled the old guy. Its Greek title, Politeia, gives us our word 'polity' - not an everyday term, and its modern meaning is any form of political entity in general - not necessarily an open, collective order, a public thing, res publica. Sea power, it appears, does not call for Caesarism. 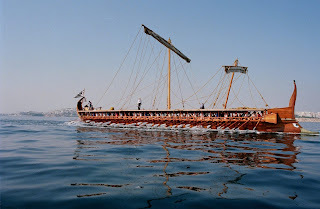 It is true that the Roman Republic had met its Ides of March well before the Battle of Actium, but - in spite of Cleopatra and her Egyptian squadron - Actium was fundamentally the last act of a Roman a civil war. And Napoleon's intended conquest of Britain met its watery Waterloo a decade before he himself met one on dry land. All of this, as you may not be utterly surprised to hear, has potential relevance to space and space opera. Space is not an ocean, and spacehands are not sailors. But (unless you have planet-surface stargates) it is even harder to march across a few AU or light years of space than it is to march across the lagoon of Venice or the English Channel. As I noted in comments to last post, your all conquering star legions won't conquer anyone if a maritime hegemony sends some battlecruisers (by whatever name) to zap them all en route. Or even pepper them with target seeking kinetic cans. But to dominate the star roads, or even the planet paths, you need a capable astrale, or whatever you choose to call your space fleet. And in the long term big picture the best way to get one is probably to foster the sort of society - broadly, perhaps, a richly complex and open society - that has historically been associated with the great maritime hegemonies. Not precisely the blessings of liberty, as such, but perhaps helpful in making the space opera come out your way. [On edit:] Ten years ago today, I speculated on the future prospects of the American idea, through the plausible midfuture and beyond. A century, a year, and a day ago, giants clashed across the North Sea. It was the single grand set-piece engagement of the big gun battleship era. Nothing like it was ever seen again, or probably ever will be. Battleships and their dreadnought cousins, battlecruisers, loom large in our collective imagination. They were and are inherently operatic. Space opera, in particular, emerged as a genre during the dreadnought era. And while it may often favor swords or space fighters, on some level space opera is really all about Dreadnoughts in SPAAACE !!! If you doubt this, take a look once again at the opening scene of the original Star Wars movie. No lightsabers are to be seen, nor even a space fighter. What we see is a spaceship - no small one - in desperate flight ... to be overtaken by a truly looming, immense, unmistakable battlecruiser. We know it is a battlecruiser, rather than a battleship, because of its hunting-down role, something that Jackie Fisher would have identified without hesitation as a battlecruiser mission. And yes, franchise canon describes this majestic ship as a 'star destroyer' but we are not fooled. Perhaps George Lucas was hazy on his 20th century naval terminology, or perhaps he felt that, in those days, battlecruiser belonged to the rival Star Trek franchise. No longer. While battlecruisers continue to have a somewhat sketchy reputation among seagoing dreadnoughts (see below), they have clearly overcome their slower if more heavily armored cousins in the battle for the stars. It is not quite clear why, of the two dreadnought* types, battlecruisers have become so predominant in space. Perhaps, for Americans at least, Pearl Harbor looms larger than Jutland. If battleships only ever existed in order to be obsolescent sitting ducks for Japanese carrier planes, their potential as terrors of the spaceways is diminished. * Dreadnought is used inclusively here, applied to all big-gun capital ships, though the term was not often applied to new battleships once pre-dreadnoughts had faded from the scene. On the other hand, the US Navy never had any battlecruisers, or at least never admitted to having any. Six were under construction during World War I, but under terms of the Washington Treaty two were finished as aircraft carriers while the others were scrapped before completion. The Alaska class of World War II was described officially as mere 'large cruisers', and their wartime service was brief, uneventful, and overshadowed by the much larger Iowa class 'fast battleships'. Independent of their role in science fiction, dreadnoughts have their own mythology. 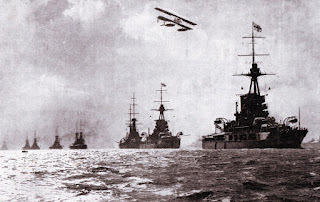 As recently as 1991, a book with the evocative title Sacred Vessels repeated the popular (pseudo-) contrarian argument that dreadnoughts were an inherently bad idea, impressive and expensive but with little actual fighting value. The fact that there was only ever one grand clash of dreadnoughts - Jutland - and that it was not a classically decisive battle, is often implicitly offered as evidence of this proposition. In fact, battleships and battlecruisers mixed it up on multiple occasions in World War II, though in much smaller numbers than at Jutland. Running fights with one to three capital ships ships on a side was the usual pattern. This makes Fisher's original conception of the battlecruiser somewhat prescient. In the early 1900s he argued that the time for stately formal engagements was passing, and that future war at sea would be, in modern terms, 'kinetic' - reliant more on speed and shock than pure mass. The experience of the 1940s generally bore him out. And - again, quite apart from science fiction - battlecruisers have their own mythology, a myth that has undergone considerable evolution. Three British battlecruisers exploded at Jutland, and went down with nearly their entire crews. 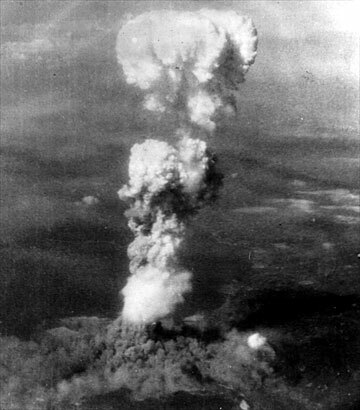 These disasters were long attributed mainly to insufficient armor protection, and the whole battlecruiser concept was often denounced on this grounds. In recent times, however, much more of the blame for the battlecruisers' losses has been placed on operational and doctrinal errors. The British battlecruiser force put great emphasis on rapid fire of their main guns - which doctrine, like the ships' speed, was part of the emerging kinetic vision of war at sea. But the emphasis on rapid fire led gunners to ignore safety precautions such as properly closing anti-flash doors, so that when turrets were hit the resulting internal fires spread down to the magazines - with predictably catastrophic results. This is often how scholarship proceeds, a cycle not unlike the fashion cycle. Perhaps by the 2060s a re-re-evaluation will again say that battlecruisers blew up because they were eggshells armed with hammers. In the meanwhile, battlecruisers may well continue to rule the spaceways - as they deserve to. And readers of this blog may continue to suspect that laserstars, for all my disclaimers to the contrary, and details of armament and configuration, are still essentially Dreadnoughts in Space. Play the Jupiter theme from Holst's The Planets, and decide for yourself. The image of the British Grand Fleet at sea comes, unsurprisingly, from a web account of the battle. And we previously considered the last battleship, along with the proto-battleships of the (actual, historical) steampunk era. 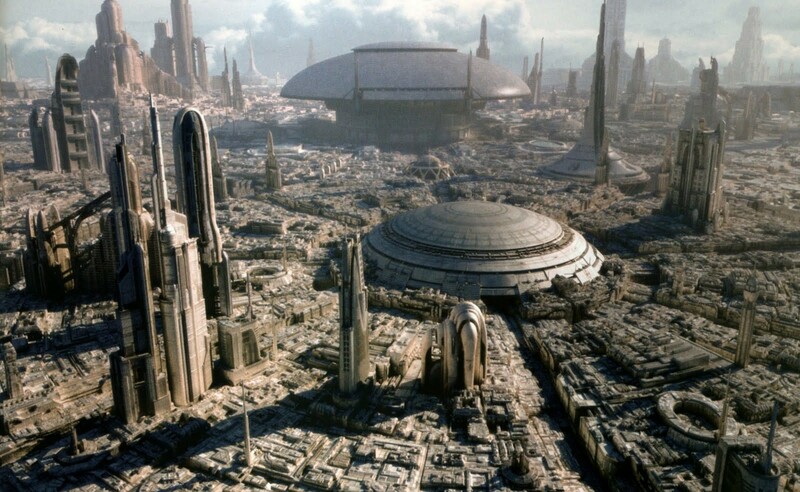 One minor but durable trope in science fiction is the planetwide city. (For which the geek (and Greek) term is ecumenopolis, 'world city'.) For now - until the Star Wars prequels mercifully fade from popular memory - most people will associate this trope with Coruscant. But accept no substitutes: really it means Trantor, capital world of the Galactic Empire in Asimov's Foundation Trilogy. Just for the record, this discussion obviously lies waaay beyond the Plausible Midfuture. Also a disclaimer that I am not trying to specifically reconstruct Asimov's Trantor, but a more broadly Trantor-esque world. I bring up this trope because one of my interests, which has gotten oblique mention here before, is urban rapid transit. And while TERTA - the Trantor Ecumenopolitan Rapid Transit Agency - never got any mention in the books, it reasonably ought to be ... impressive. As useful background for a transit ride, a few words - well, quite a few - about the overall cityscape, starting with its population. The Good Doctor A slipped up badly on this score. His canonical figure for Trantor - 40 billion - is laughably low, only a few times current world population. We want a global city, not a world of ten-acre exurban ranchettes. Donald Kingsbury does much better in his unofficial Foundation sequel, Psychohistorical Crisis. His version of Trantor, called Splendid Wisdom, is home to a nice, round trillion people. Spread over the whole surface of an earthlike planet, even this comes out to merely suburban average density. But if we leave the oceans wet and only urbanize the land surface, we get roughly the population density of San Francisco. Now we're talking. San Francisco, outside the Financial District, lacks the glass and steel canyons look, but cityscapes can vary considerably for a given density. Central Paris apparently has about the same population density as Manhattan, but a very different urban look. Likewise a modest urban density could still have an impressive skyline. The image of Trantor (nominally Coruscant) above - click to embiggen - hints at one way of finessing this. Most of the city seems to be low-rise, or at least of roughly uniform height, but with monumental structures rising above the rest for added zip. Another consideration is that an ecumenopolis surely cannot be like an ordinary habitable planet, where humans merely skim the cream off a self-sustaining natural ecosystem. It will need something more like a spacecraft life support system, on a suitably giga scale. The details are far above my biology pay grade, but may well imply vast sublevels of, essentially, plumbing. 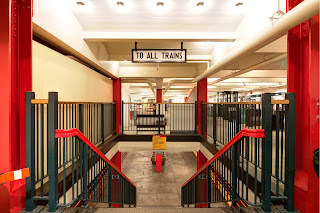 The subways could thus run through what amount to basements rather than true tunnels. And the oceans may effectively be sewage treatment / oxygen regeneration ponds - nothing you would want to swim in, which at least would keep shorefront promenades from being impossibly crowded. Parts of the life support system might rise to or above surface level, and some of the megastructures could well be the equivalent of rooftop air conditioning equipment. Also, the population density need not be uniform all over town. If you really don't like urban living, Trantor is not the planet for you. But many neighborhoods (totalling millions of km2 and a couple of hundred billion people) might well be at suburban density, balanced by high-rise urban districts, thus accommodating people who want a yard as well as those who prefer living near good shopping and restaurants. Kingsbury mentions one such commercial district on Splendid Wisdom that is suitably Trantorian in scale. I forget its name, but since Splendid Wisdom is a rebuilt Trantor of the Second Empire, I will call it Seldon Street. Though technically a pedestrian mall, functionally it is a suitably giga-scaled version of Market Street or Wilshire Boulevard, extending for some 3000 km. That being a long, long stroll, expect some serious transit lines to run along the Seldon Street corridor. But before we ride, a few more thoughts on the cityscape. First, a couple of annoying practicalities. Realism[TM] is not really a key issue in this exercise, but we should give it a superficial nod. On a world without farmland, how do you feed a trillion people? Asimov's Trantor imports its food from 20 agricultural worlds, but they could only supply this Trantor with delicacies. For basic food supply you need a planetwide array of oscillating hands: something something hydroponics, something something algae. And, of course, all this stuff should really be on the surface, with the city life below, but we want a planet that looks urban. We will delicately assume that technology originally developed for spacehabs and such will solve food supply along with the rest of the life support challenge. Energy supply turns out to need less handwaving than food supply. An earthlike planet absorbs on order of 10^17 watts of insolation (instellation?) 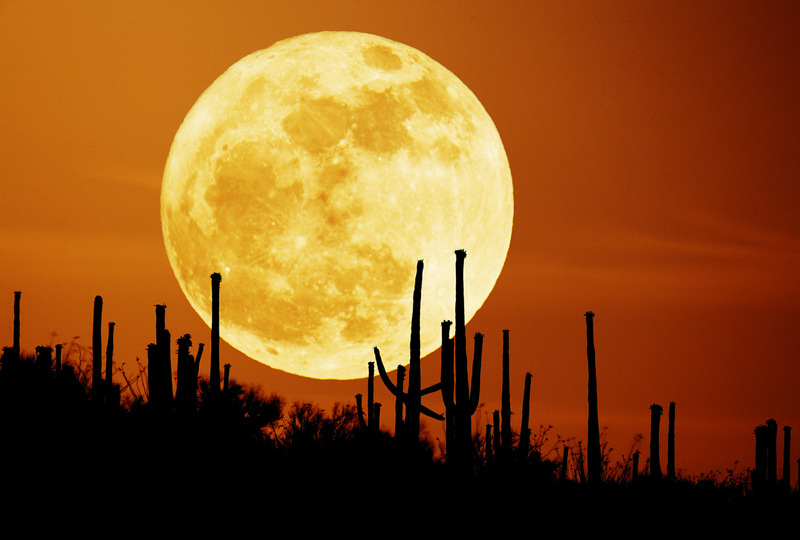 from its parent star. Current average US energy usage is about 10 kw/capita, scaling to 10^16 watts for a trillion people. So cover the rooftops with solar panels and you more or less get there. Waste heat disposal is not a problem, because you are merely using energy the planet would absorb anyway. And energy consumption on Trantor can be relatively modest. It is not an industrial world; as the Imperial capital, its chief manufactured product is government. 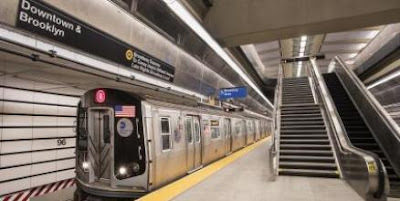 Large cities also tend to be energy efficient - not least because people ride the subway instead of driving. From these material concerns we can turn to social considerations. An ecumenopolis must have substantial overall social stability to function at all, but Trantor presumably has its good neighborhoods and not so good, perhaps including slums the cops only enter in army-corps strength. Or - another familiar urban SF trope - class stratification might be literal, with the down and out living among the plumbing sublevels, while the upper classes live on upper floors, the richest in penthouses. 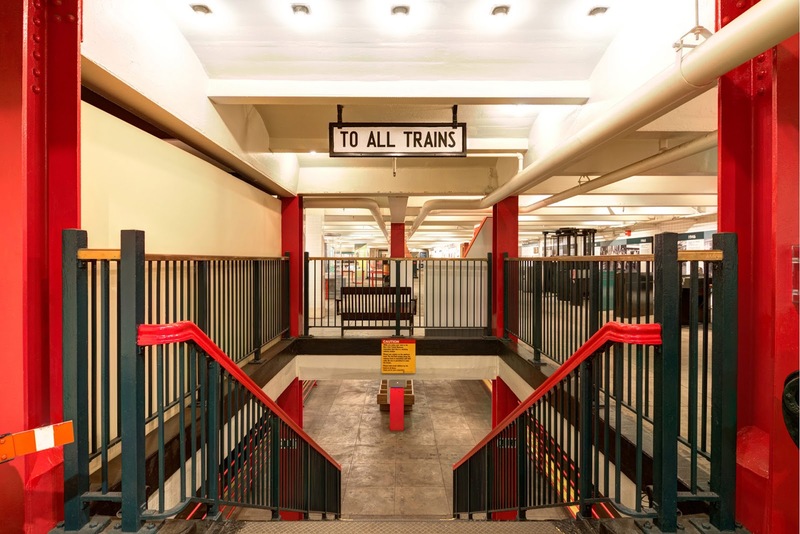 This lends itself to a transit subtrope that goes back to 1890: dismal subways for the poor, elegant els for the rich. Note that the district shown in the image above must be served only by subways; there are no hints of elevated lines. Given a world of a trillion people none of this needs be an either/or: Within vary broad limits, Trantor's cityscape and social life can be as varied - including the charmingly urbane and the dystopian - as you want them to be. On yet another note, Isaac Asimov was famously agoraphobic, and his Trantorians rarely went up to the open surface. Depending on how the life support system operates, 'rarely' might be never, at least without a quasi space suit. But this too is not a given. An ecumenopolis, or neighborhoods thereof, may have rooftop gardens and dining patios under the solar awnings, and even (shock!) open air streets instead of roofed over corridors. When I speak of the Seldon Street corridor I say nothing about its architecture, only that it is an elongated urban district. Trantor might even have parks, though the only open space on Asimov's version was the Imperial palace grounds. But we have not come all this way to an ecumenopolis to visit a park. You can find those on any garden colony world. So in our next exciting episode we will head for Seldon Street. And since it is already mostly written, you won't need to wait until the Galactic Era to read it. 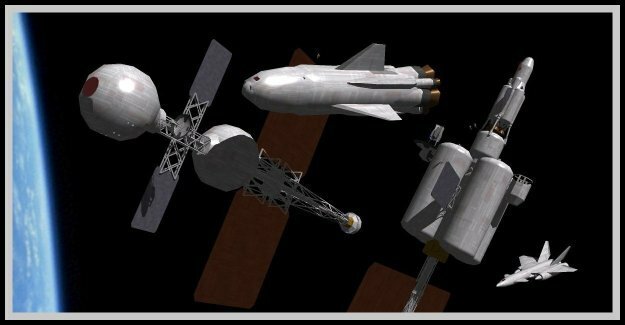 Yes, knowing this blog's commenter community - if you have not all given up and deserted me - the discussion will work itself around to space battles. The cityscape image comes from a blog review of Second Foundation. Alas, I know nothing of the artist who created it.